This mini-festival has been invigorating, even if too tiring to take as a whole - and towards the end of a year dominated by exposure to a surfeit of Shostakovich's music. There were concerts, talks and films, the whole organised smoothly, with additional films to be watched in the foyer throughout. Audience numbers were less than the promoters probably anticipated. The Arditti Quartet's opening recital, given without an interval, had made for a memorable hour. My own preference was for the briefer Quartetto Piccolo of Silvestrov and, especially, Galina Gubaidulina's 10 minute String Quartet No 2. The next concert began auspiciously with Gubaidulina's eponymous title piece for the festival, Dancers on a Tightrope played with verve by Andrew Haveron, supported by our imperturbable John Constable wielding a glass tumbler inside the piano. I look forward to the BBC's Gubaidulina weekend at the Barbican next January. Some individual events tended to be less satisfying as a whole than in prospect, despite invariably high quality performances. Most notably so was Kremerata Musica's concert of chamber music by Gubaidulina, Kancheli, Schnittke and Silvestrov plus Part's Fratres. Led by Gidon Kremer, his young musicians gave riveting accounts of each work, the pianist Katja Skavani especially noteworthy for her subtle voicing of the music at all dynamic levels (also for her bow, deeper even than Rolf Hind's!). Kancheli's piano quartet reminded me of Reinbert de Leeuw's classification of composers into those that create new works each different, and others - he cited Ustvolskaya and Bruckner - who compose always the same work again and again. Kancheli, to my mind, fits into that category and the shock of the new in his violent juxtapositions fails in its effects once they have become familiar and expected. Some of Schnittke's too lose out for the same reason; the trenchant String Trio, now incorporated into the regular repertoire and always powerfully affecting to new listeners, is one such. A poorly attended evening of Shostakovich's prolific music for the cinema at Queen Elizabeth Hall was given in a lavish presentation scripted by John Riley, with Simon Russell Beale as the composer and the City of Birmingham Symphony Orchestra under the sharp conducting of Mark Fitz-Gerald. They accompanied bits of quaint old films, some early silents, later over-the-top Stalinist Soviet patriotic, and excerpts from his substantial late scores for Kozintsev's Hamlet and King Lear. All well coordinated, but unwisely given without a break, this was a strenuous experience of only intermittent musical interest; less rewarding than the recent Proms matinée at Cadogan Hall. All too few were present likewise for what was for us the greatest experience of the whole weekend: a lunchtime showing of two great VPRO Netherlands TV films about Galina Ustvolskaya, A Cry in the Universe and Ustvolskaya: Symphony No.2. 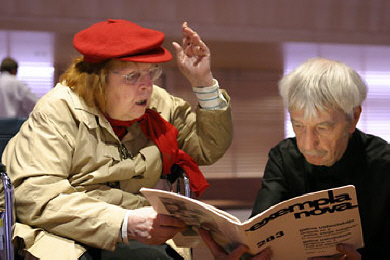 Film director Josée Voormans had persuaded this reclusive, frail and elderly camera-shy composer to leave her home and come to Amsterdam to hear her music rehearsed and performed and, extraordinarily, to record what Gerard McBurney believes may become her only interview to be preserved for posterity. And Odette Toeset's filming of a studio performance of Ustvolskaya's Symphony No 2 has achieved one of the best films of an orchestral performance ever made; one in which the camera images enhance the impact of the music to a quite extraordinary degree. * q.v. The Guardian: "- - if Dancers on a Tightrope has proved anything, it is that blanket programming of these composers does them no favours. Heard in isolation, several of these pieces might have seemed a powerfully personal statement of despair. 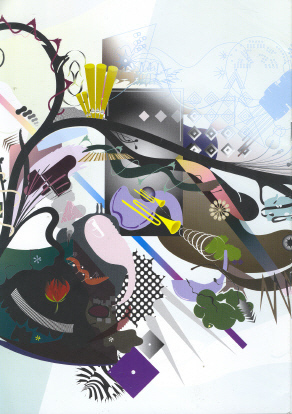 In relentless succession, they began to seem merely mawkish." 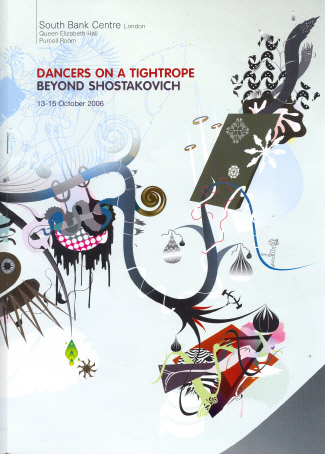 Kandinsky-inspired programme cover picture by youthful illustrator Edvard Scott!